When you think of high-powered NCAA passing offenses, you think of Big 12 teams like Oklahoma and Oklahoma State. Or the Air Raid offense of Mike Leach’s Washington State Cougars. Those teams are the top three NCAA passing offenses this season. But if you go a little bit down the list, at number 24, are the Buffalo Bulls. Yes, UB has one of the top 25 passing offenses in the country. 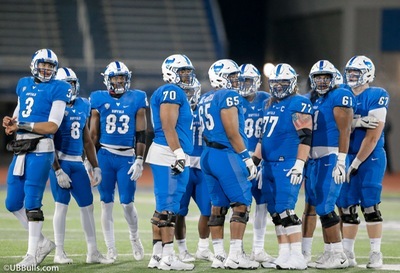 This season, the UB offense has developed and emerged as one of the most dangerous in the MAC, and one of the most entertaining. Remember, those passing statistics have come from three different quarterbacks. That’s encouraging, because the success has been driven by a system that can be adjusted to different QB’s with different styles. If you’re a stats guy like me, think about this regarding the entire offense this season. The Bulls have had two quarterbacks throw for 400 yards in a game this season (Tyree Jackson, Drew Anderson). A quick check shows that only Washington State has done that this season. Three different receivers have topped 100 yards in a game (Anthony Johnson, Kamathi Holsey, K.J. Osborn). Two running backs have gone over 100 yards rushing (Emmanuel Reed, Theo Anderson). Nine different players have made a play of 45 yards or more. Big plays. Big yardage. Big excitement. 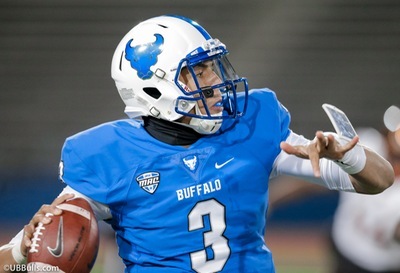 Bull Session Trivia: Tyree Jackson’s career-high 406 yards passing against Bowling Green made him the 5th UB quarterback in the FBS era to throw for over 400 yards in a game. Can you name the other four? For the second straight week, Jackson set a new career high in passing yards. He’s racked up 719 yards in the last two games. No UB quarterback has ever thrown for over 300 yards in three straight games…One of the best throws I’ve ever seen Jackson make came in the first quarter against BG. Under pressure, Jackson rolled to the right. While being chasing, and never having a chance to set his feet, he flicked his wrist and tossed the ball 51 yards to Holsey for the game’ first big play…The Bulls offense is just 154 yards away from becoming the fourth team to throw for 3000 yards in a season…Anthony Johnson is now the 4th Bulls player to top 1000 yards in a season, and the first since Alex Neutz. He’s 354 yards away from Naaman Roosevelt’s single season school record of 1402 set in 2008. A big reach, unless AJ gets an extra game via a bowl trip…Johnson still leads the MAC in receiving yards, and ranks 5th in the NCAA…Holsey has caught 20 passes for 398 yards in the last five games…When Johnson was knocked out of the game in the second quarter, Jacob Martinez replaced him and had 59 yards on four catches, including a 30 yarder…Theo Anderson’s breakout 133-yard performance was fun to watch, especially when he started running over Bowling Green defenders in the fourth quarter….The Bulls have outscored opponents 96-65 in the first quarter…The Ball State defense is struggling in MAC play. They have allowed 50 points or more in 5/6 conference games, including four in a row…They are the last ranked defense in stopping third downs, at 47%…The Cardinals do have one of the best pass rushers in the country. DE Anthony Winbush has 10.5 sacks, 14.5 tackles for loss and 5 forced fumbles. But only 3 of those sacks have come in the last six MAC games…Middle linebacker Jacob White leads the team in tackles. He’s been playing all season with a club on his right hand to protect a broken bone….Ball State’s pair of junior cornerbacks (Marc Walton, Josh Miler) usually stick to their sides, so both will try to slow down Johnson. Lost in all of the offensive stats from Bowling Green, was one of the best games ever played by a Bulls defensive lineman. Chuck Harris had 5 tackles, 1 sacks, 3 tackles for loss and 2 forced fumbles…The Bulls have had 12 sacks in the last six games…Khalil Hodge was back in double digits with 10 tackles. That allowed him to set a UB FBS record for tackles in a season with 129. He broke Justin Winter’s nine year old record. Hodge is 5th overall in school history, and he’s 32 away from Craig Guest’s all-time school season record…Khalil remains second in the country in tackles. He’s first in the MAC, 37 tackles ahead of the conference’s number two tackler…Justin Brandon made one of the plays of the year when he ripped the ball out of the running back’s hands and set the Bulls up for their first score. This week is a homecoming for Brandon, who hails from Indianapolis, not far from Ball State’s campus in Muncie…Ball State’s offense has been hit hard by injuries. Seven opening day starters are no longer playing. Last year’s MAC rushing champion, James Gilbert, has missed the last seven games and won’t play this week. Neither will QB Riley Neal, who’s also missed the last seven games…That’s forced the Cardinals to become the NCAA’s first team to start four quarterbacks this season. Redshirt freshman Drew Plitt is expected to get the nod this week, his third start of the season. Plitt was benched last week, after getting sacked five times in the first half against NIU….Despite the QB carousel, freshman receiver Justin Hall leads the MAC with 65 catches. That’s two more than UB’s Johnson…Fellow freshman running back Caleb Huntley is the MAC’s 5th leading rusher…The offensive line has been the hardest hit Cardinals unit. Ball State may be missing their season opening guards, left tackle and center for this week’s game….Since scoring 28 points in their last win in week three, the Cardinals offense has topped 20 points only once, and averaged just 12 points per game during their seven game losing streak. 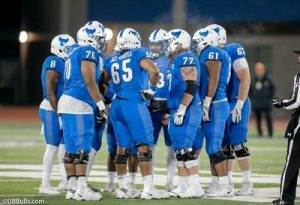 The UB Bulls offensive line. I’m guilty of not giving the offensive line enough love. All those numbers I talked about from the quarterbacks, running backs and receivers would not happen without the big guys up front. Well, I’ve got some numbers for the offensive line. The Bulls have allowed only 13 sacks all season. That’s first in the MAC, and 17th in the NCAA. The Beefy Bulls have allowed only 38 tackles for loss. That also leads the MAC, and ranks as the 6th fewest in the nation. The Bulls have used only two different starting line combinations this season. But they regularly use four reserves during games, in order to build depth. Bull Session Trivia Answer: Drew Anderson threw for over 400 yards this season (597, Western Michigan). Joe Licata did it twice, 497 yards against Toledo in 2013 & 401 vs. Army in 2014. Chazz Anderson went for 404 yards against Northern Illinois in 2011, and Zach Maynard armed it out for 400 against Pitt in 2009.